This past November I was lucky enough to have met Maud Cotter at her book launch of her latest publication All Stuff is Farce, at the Irish Consulate here in New York City. 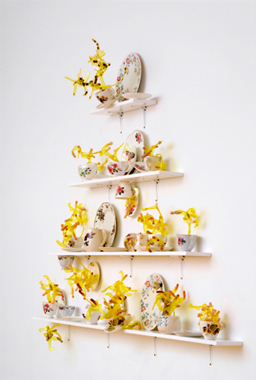 My immediate attraction to Cotter’s work was her capability to take everyday objects and extend their life into a whimsical realm where realities are questioned and curiosities of form prevail. I was scheduled to do a tour of Brooklyn with the wonderful artist, and professor, Rocky Horton of Limpscomb University and knew we had to get his students in to see Cotter’s studio at Point B. Cotter greeted us and then proceeded to enlighten; reflecting back on her previous explorations, building on those that she embarks upon in her current practice. By the end of the visit my pot was boiling with questions and yet again, Cotter was lovely enough to comply. AB: Congratulations on your latest of books, All Stuff is Farce. As I was enjoying the essay in your book by Joseph R. Wolin, he linked your work with the writings of Czech philosopher Vilém Flusser. How has his influence shaped your latest body of work displayed in your recently published book? MC: Thanks Anneliis re ‘All Stuff is Farce’. As to the question…big question….Here it goes….I see my practice as an investigation into the nature of energy in all its forms, human and natural and it’s activation into the future. How it/we remodel the world. Vilem Flusser, has articulated an understanding of material that helps me to position my work within that very broad context. For example in his essay he speaks of the world of phenomena as we perceive it as being an amorphous stew. As a student I painted a watercolour titled ‘Primordial pastrami’ which was approaching a similar idea of ‘stew’, so this cauldron, this stew which contains everything, existed for me at the very start of my being an artist. This is, to my mind, a critical consideration in putting ideas together. It also clearly offers the possibility of changing the forms, remaking the world, even if the stuffing remains the same. Changing the stuffing and leaving the exterior packing is another play on this. I modeled the title of the book from his essay…… he says “ everything material in the world, everything made up of stuff, is a farce”……I say as a title for my book ‘All Stuff Is Farce’. As a matter of interest I gave a copy of his essay ‘Form and Material’ to the writers who contributed to the book, Matt Packer and Joseph R. Wolin, just that, images of the work and nothing else, no notes of mine. AB: Often your work has been tied with domestication, due to the categories of ready-mades that you appropriate from. For example in the works of Soul Mates and Not the Full Story, you have chosen to work with rose covered teacups that seem to have spilt their contents into a space like dimension. Do the teacups reflect more to your feminine sensibility or is it the form and function that lend to your decision of using them in your work? MC: My entry into smaller domestic objects as a field of play came at the end of a number of years investigating larger forms made up of repeated elements. 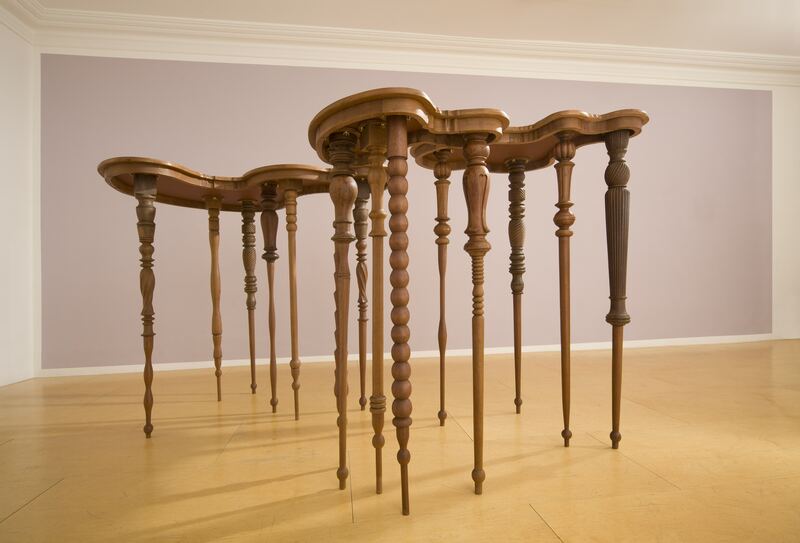 These clustered into swarms of elements making larger forms, in the case of ‘More than Anything’,(2004) they became investigative mechanism, a tool. A form that behaved like a disease in the way it occupied a building, ingesting space, adaptive etc …..long story. Having made something potentially endless that dispersed and morphed into every given situation I became located on the intimacies of building, the hinges, the detail, rather then a system that extended built form. That is the way it goes with me sometimes, having made something big, I make something small. Maybe I was looking for a root, what I found was the place where the body meets smaller intimate objects, ones that we live with like a cup, for example. The space in one’s mouth mirrors that which we offer to it, in the form of a cup. I began to see the simplest of objects as generators of the larger built world. The domestic condition is the human condition, to me it speaks of our intimacy with materials. In the case of ‘Not the full story’ I withdrew the function of the cup and implanted another energy. The yellow Perspex lazer-cut elements in the piece are the cut out pattern of a wooden kit which makes a dinosaur. I bought it in the Museum of Natural History in London. I assembled it not to make a dinosaur and made it behave like a spider plant. I like the mix. Is that a female way to behave? I am not sure…… it has a echo of conversations through generations, both my brothers and myself would have had tea from such cups in my grandmothers house. AB: In your book Wolin discusses your work Crying Over Spilt Milk, he wrote that the work was operating via “emotional residues” when “the material substance occupies the form of a table.” Could you please explain further on the “emotional residues” and how it affects your process? 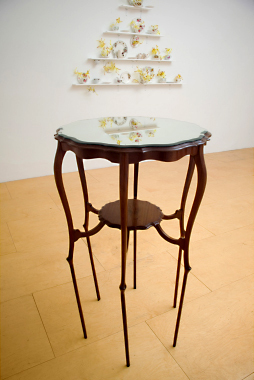 "More Than One Way Out" 2009, by Maud Cotter Mahogany, Brass, Paint. 335 X 210 X 330 Cm. When choosing a found object, I tend to choose one’s that have acquired some emotional weight as it were. 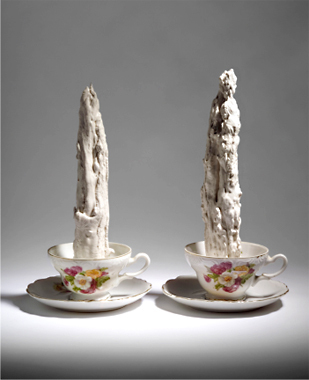 Used and reused objects allow something I call ‘emotional residue‘ to gather around them. I use this as part of the energy in the piece. When it comes to larger objects like Chartres Cathedral for example such residues and aspirations gather like a cloud in the interior, suspended between one’s head and the roof of the building. AB: Last year you created a great work here in New York, Rumpus Room that critics attribute to the synthesis of your explorations in your sculpture. Tell me about your artistic love affair with Point B residency here in Brooklyn and how it has helped you in your artistic practice? MC: Yes I made an important piece in terms of my practice at Point B last year, called ‘Rumpus Room. I used the space frame or drawing of a room to explore some ideas of objects transcending their domestic context. The turbulent tone in rumpus appealed to me, gave me an opportunity to tumble and lift objects away from their normal existence. It was great to first of all work on the piece there and then to install it in their Project Space. I have been coming to Point B for the last four years, that continuity has fed a stream of change in my work. Point B provides a great base, a perfect mix of a living and working with as much isolation or contact as you like, a simple but great idea. One feels in a close relationship living and sharing the space with other artists, while being alone at the same time. The culture of Point B is a special one, It allows one space and time to explore new ideas, with the backdrop of New York to examine them against. It’s a real hide away from the world and yet it is close to an intense centre of practice. It works for me. 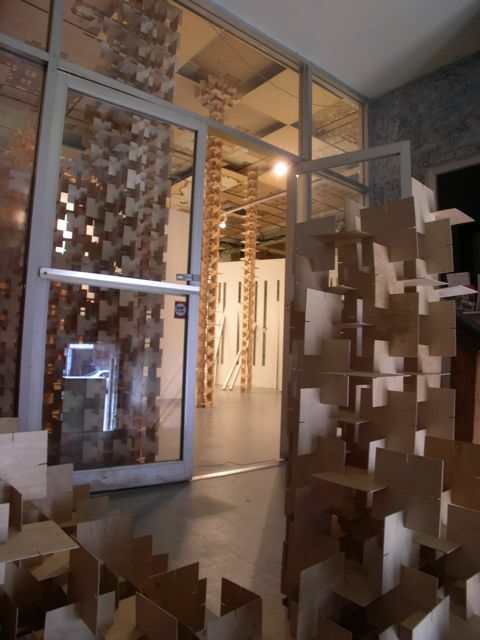 Maud Cotter’s work is a highlight of the show: a sculptural work of interlocking wooden square pieces placed somewhat sporadically throughout the gallery in stalwart pillars, undulating over walls, and traversing down stairwells. 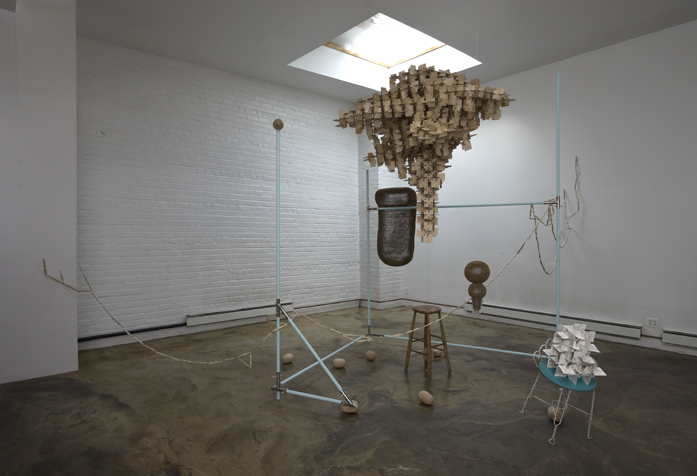 Maud Cotter’s work examines the inherent meaning and physical properties of sculpture and architecture and the space it inhabits, while concurrently working toward a space between a figurative existence and an abstract prominence. Known in Ireland for her 30-year career in sculpture and pioneering the modern genre of the medium, Cotter founded the Sculpture Factory in Cork, and has installed similar sculptures like the one at The Lab in the Court House of Cork, Ireland, the Irish Museum of Modern Art, Brussels, and galleries in New York, France, Wales, Ireland, and England. An opportunity to view her work here in San Francisco should certainly not be missed. "More Than Anything" Installation view of Cotter's work for exhibition 'Enter Slowly' at The Lab in San Francisco.